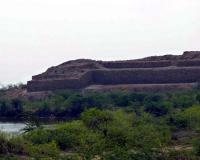 Port of Banbhore is part of the Tentative list of Pakistan in order to qualify for inclusion in the World Heritage List. To help understand the site it is well worth starting with the surprisingly good little on-site museum from the 1960s. It contains a reconstruction of the stratigraphic sequence across 23 levels of habitation which have been uncovered since excavation started in 1958. Hindu, Buddhist and Muslim artefacts are on display showing the changing nature of the societies occupying the site. Among these are a pot clearly marked with Chinese characters showing that Banhbore was part of the silk route trading system. Banbhore is also thought (though, as I understand it, not definitely proven) to be the town of Debal where the Muslim invasion of the Indian sub-continent by the Ummayads took place in 710. One “building” whose remains are clearly marked within the site is that of the mosque – which is said to be the first erected in the subcontinent. Its lack of a Mihrab and an inscription shows its extremely early date of 727 (However the Cheraman Juma Masjid in Methala, Kerala, India claims to date back to 629). The city after this point clearly became divided into Muslim and Hindu quarters. We passed a pleasant couple of hours divided approximately equally between the Museum and a walk around the site – up through its landward entrance and partially reconstructed walls (photo), through the exposed streets past the mosque (and indeed one small area of plastered wall (semi) protected by a covering and on to the seaward entrance where the port would have been. Vast areas of the site are unexacavated and one suspects that there is much more of value to uncover. Banbhore’s 2 main claims to fame would appear to be its role in the Silk route and in the bringing of Islam to the sub-continent. India has placed a number of silk route sites on its T List, but the Pakistani text on its T List presentation for this site doesn’t mention this aspect and concentrates instead on the claim that it represents “the best preserved early Islamic urban form in South Asia and the regions best preserved mediaeval port”. My guess would be that the site could have the potential for inscription but that it is a very long way away from being able to do so.